Here are answers to some common questions we receive about PUG. How do I join Prescott Ukulele Guild? The first visit to PUG is free, so attend a meeting and decide if you’d like to join. If so, you will be asked to pay the yearly dues, prorated for the balance of the year (annual membership is currently $36) and given our “Aloha” binder with core songs that are not included in our main music book, The Daily Ukulele, 365 Songs for Better Living (a.k.a. Big Yellow). We are currently reformatting all our Core Songs into new song sheets that will incorporate lyrics, chords and notes all in one file and which will be downloadable here for insertion in the “Aloha” binder. The Daily Ukulele book is available online, or at Pop’s Music in Prescott. What if I don’t know how to play ukulele yet? We have a Newbie/ Beginner’s Group that meets most Thursday nights at the Las Fuentes Resort Village, that can help you get started with your playing. Please see our Events page. There are many online resources, paid and free, for learning ukulele (YouTube is your friend!). Also, group member Steve Edwards teaches ukulele at Pop’s Music Store in Prescott. Visit the Ukulele Lessons page. A better uke does not necessarily make the better uke player. More money does, however, buy better sound. (And a real cheap uke might hold you back. ) 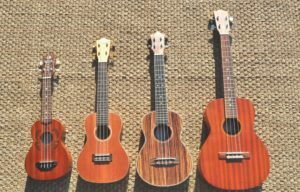 Our members play everything from the soprano ukulele (made famous by Tiny Tim and others) to concerts, tenors, baritones and banjoleles – and even bass ukuleles. To get started, please visit our local Prescott music shop, Pops Music Store, on Iron Springs Road. Where can I get all my small Jumping Jim books bound into one convenient spiral book? Members have taken books to have them spiraled at A&E Reprographics at 1030 Sandretto Dr. Their phone# is: 442-9116.